ZEBULON, N.C. -The Carolina Mudcats and Cleveland Indians jointly announced the signing of a two-year player development extension that keeps the Indians in Zebulon through the 2014 season. Additionally, the Mudcats will be hosting a major league exhibition game with the Indians on Tuesday, April 3, 2012 at Five County Stadium that will be presented by Ballpark Stores and BP. "We are pleased to not only welcome the Indians but to also go ahead and extend our partnership," said Carolina Mudcats owner Steve Bryant. "Cleveland has fielded championship-caliber clubs at the Class-A Advanced level and we are excited to begin working with the Indians. We also look forward to the Indians visit to Wake County and introducing their players, coaches and staff to our fans." The 2012 season not only marks the first season of the player development contract with Cleveland, but also begins the Carolina League era for Carolina. "The Carolina League has a rich history and North Carolina professional baseball has played an integral part in the success of the league over the years," said Bryant. "The level of play is excellent and our fans and corporate sponsors will have the same great experience as before this transition. An added bonus is that the Carolina League teams are close enough for our fans to be able to reach away games more easily." The Indians have enjoyed a strong bond with Eastern North Carolina, as Kinston has hosted Cleveland's Class-A Advanced affiliate since 1987. During that time, the Cleveland/Kinston partnership won Carolina League championships in 1988, 1991, 1995, 2004 and 2006. "We couldn't be more excited about our new affiliation with the Carolina Mudcats. This will be an incredible addition to the Cleveland Indians player development system as we are adding a Triple-A caliber ballpark and facility in a major metropolitan area while remaining in what we feel is one of the best developmental leagues in professional baseball," said Ross Atkins, Cleveland Indians Vice President for Player Development. "Most importantly, we know the staff and leadership of the Mudcats to be very well respected and of the upmost professionalism. We expect this to be the beginning of a very long and productive relationship." Five County Stadium will welcome Major League Baseball for the 7th time with the April 3 exhibition. The Pittsburgh Pirates (1992, 1994, 1996), Seattle Mariners (1997), Florida Marlins (2003) and Cincinnati Reds (2008) have all played games in Zebulon. The game will be presented by Ballpark Stores and BP. Ballpark Stores has 14 locations in Wake, Johnston, Franklin, Granville and Wayne counties that are operated by Wayne Oil Company, headquartered in Goldsboro. "Ballpark Stores is excited to be the official sponsor of the Mudcats vs. Cleveland Indians game," said John Strickland Jr., President of Ballpark Stores. "This is a unique opportunity to partner our brand with the Mudcats. We are excited to be a sponsor and assist in bringing a unique entertainment opportunity to the Eastern part of North Carolina." The 2012 season is the 22nd season for the Mudcats, a fixture in Wake County which began play in Zebulon in 1991. The Mudcats begin their partnership with the Indians in Carolina League play on Friday, April 6, 2012 as the host the Winston-Salem Dash. 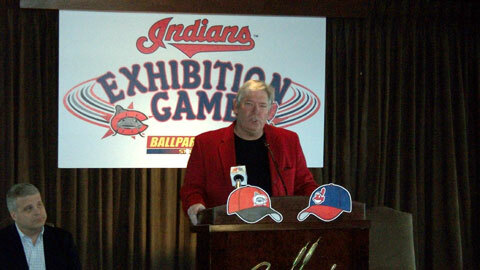 Tickets for the exhibition game with the Indians will be on sale beginning at 10:00 a.m. on Thursday, January 12. Tickets will be available for purchase in the premium field level ($22.50), box seats ($19.50), reserved field level ($16.50) and general admission ($12.00) areas of Five County Stadium. Fans purchasing tickets to the Indians exhibition game will also receive tickets for Opening Day. First pitch on April 3 is set for 2:00 p.m.